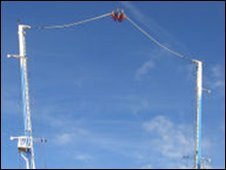 The mother of a teenage girl who was in a reverse bungee ride which failed at Hull Fair has said she was shocked at the peril faced by her daughter. Wendy, who could not give her full name for personal reasons, said her teenage daughter Saffron was on the ride when one of the elastic straps broke. "It just kept going round in my head - about how bad it could have been." Ride owner Stanley Reeves said it had been retested by an independent engineer and would re-open later. Wendy said she was shocked when her daughter called her from the fair and told her what had happened. "I know how high it goes. I'd been in the afternoon and I'd been watching it, and I actually thought, 'How safe is that, it's a piece of elastic'. "I couldn't believe that she was telling me that it had snapped and what could have happened to her, and I just thank God that she was safe. I just wanted her home," she said. Mr Reeves, who runs SDL Rides, said: "The bungee failure safety system came into action and worked properly. "The ride has been retested by an independent engineer and will re-open on Monday evening." He declined to elaborate on the reasons for the ride's failure or discuss the evening's event. In a statement, Hull City Council said: "Within minutes of the incident, Hull City Council's health and safety officer attended and it was agreed with the operator that the ride would be closed straight away to allow a full safety check to be completed. "The check revealed a systems failure, but the ride's safety mechanism worked immediately, preventing it from taking off and instead moving the carriage to one side and bringing it to a halt. "We would stress that the safety and wellbeing of the public is of paramount concern to both the council and the fairground operators."